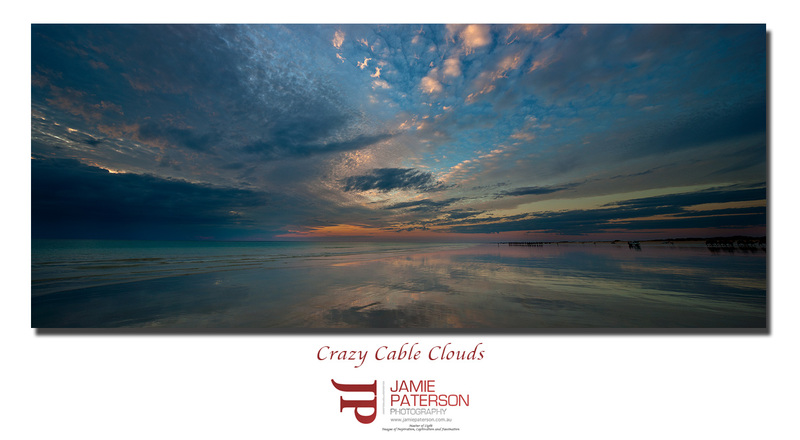 This entry was posted in australian landscape photography and tagged australian landscape photography, australian photographer, broome, cable beach, cable beach photos, landscape photography, landscape photography australia, seascape photography. Nice painterly look to it as well. Hey Merv. Thanks for that mate. I’m pretty proud of this one. Awesome shot again Jamie, the clouds are crazy aren’t they? Did you put a texture in there too or was that the clouds all on their own? No textures at all, just plain old crazy clouds! That night was so much fun. WOW Jamie, that’s even cooler, I thought you might have been having a bit of a play because of the way the dark blue was coming through, that’s just ridiculous that the sky can be like that. It’s amazing. I think I’ve discovered at least one of Mark’s secret. The Canon 17mm TSE just produces amazing skies. Its mind blowing. Yeh I wouldn’t mind getting me one of those, it is definately on the list that’s for sure. Same. I hired this 17mm TSE to see what I thought of it. I’ve always thought mother nature produced the skies. Good point Merv. She does. I should’ve said the 17mm seems to be able to capture those amazing skies. Good idea to hire it Jamie. That is what I thought as well. I wasn’t going to shell out a stack of money if it wasn’t for me. A wonderful comment to end my day. Thanks very much mate, appreciated. Certainly a different sunset, love the wet sand reflection! Sorry mate maybe next one! Beautiful image, lots happening but very specky…. Hi Peta. Thank you very much. I liked this one so much I’ve ordered a print of it for myself.